Can you "catch" all these colorful bugs, then put them back where they belong' Redesigned artwork brings new life to these much-loved, creative magnetic games. 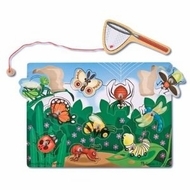 Includes beautiful board with 10 magnetic pieces and magnetic wand. Measures 12.5" x 8.5" x .08".